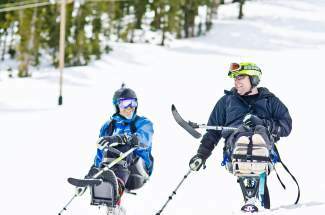 Achieve Tahoe athletes ski during a previous winter season at Squaw Valley. Founded in 1967 and known as Disabled Sports USA Far West since 1998, the organization has become well known throughout the country for its groundbreaking work and has been instrumental in establishing Disabled Sports USA, which is now a thriving national organization with more than 120 active chapters. While Achieve Tahoe will continue to be a chapter of Disabled Sports USA, the new identity is designed to communicate a clearer message to the community, reach a wider audience and result in the opportunity to provide services to more people. The organization’s mission — “To provide affordable inclusive physical and recreational activities that build health and confidence” and its motto: ‘If I Can Do This, I Can Do Anything!’” — will remain unchanged. Achieve Tahoe will begin teaching specialized ski and snowboard lessons for the season on Friday, Dec. 18, offering instruction seven days a week at Alpine Meadows | Squaw Valley. Visit squawalpine.com to learn more. The nonprofit also will accommodate students upon request at Northstar California, and it will continue to offer summer sports programs at various locations throughout the North Tahoe region in 2016, including waterskiing, four-wheel drive adventures, kayaking, paddle boarding and hiking. This article was submitted by Achieve Tahoe, which is staffed by a corps of more 150 trained instructors (90 percent of whom are volunteers). Visit achievetahoe.org to learn more.